The doctor is in! And he's prescribing FREE spins and tripled wins! The hospital has never been so fun in this cute and romantic online slot game. Good luck! Romance in the emergency room isn't a new idea but with Doctor Love in the room your pulse is bound to start racing. 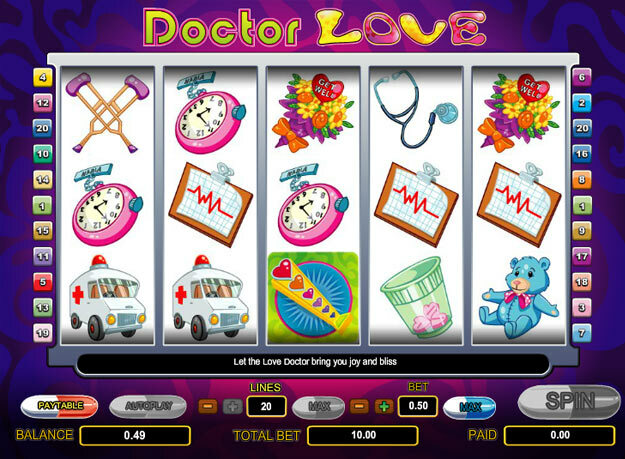 Give Doctor Love slots a go to net some top jackpot cash and enjoy the fun romantic theme as you do. Place your bets over 20 pay lines and look out for scatters and wilds to rack up those cash wins. Play Doctor Love at and feel the love for this fun, flirty online game.